1. It's too hot to sleep in a tent in the day time. Now, there's not a whole lot we can do about number 1 without getting Air Conditioning for the tent (stay tuned, we're planning it! ), but we CAN do something about number 2! On one trip to the desert, some of us played outside the camp site. 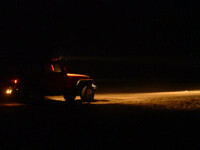 A KJ-Cherokee fitted with extra lights attempted the dune climb. 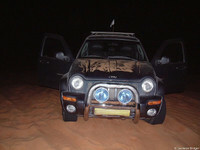 We were heading up the dunes and came accross a small bump. We went for it, and discovered it was not the right spot! There was a hole behind the bump that was hidden in the shadows. The Jeep took off, and landed nose-first on the other side, damaging the front bumper. The tracks can be seen on the right where the Jeep left the ground! The lesson learned here was that the placement of lights and their beam pattern is more important than how bright they are! 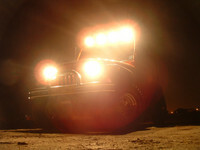 How bright the lights are affects how far and how sharply you can see, but the beam placement can affect WHAT you see. In the above situation, the lights were mounted low, so they cast a shadow because our point of view was above the lights. The solution was to place the lights ABOVE our point of view so we could always see the ground, never losing anything because of a shadow. 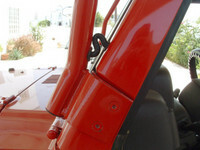 This also means we are not adding a restriction to the air flow to the radiator, as seen on the above Jeep. The problem then was how to mount them. The Jeep Wrangler has a removeable roof so directly attaching the lights to the roof was a bad idea. Fortunately, Mopar Accessories has the perfect solution. The Mopar Lightbar follows the Jeep's lines very nicely compared to some aftermarket alternatives, and also has provisions to run the wiring inside the bar for a clean finish. We picked up the Mopar Lightbar and Mopar-KC Lights for installation on our Jeep. I should make it clear at this point that this is a review, not an install guide. They were Mopar parts, and the vehicle is within the warranty period, so we just let the dealer install these. If you would like a set of KC lights for your vehicle, we strongly recommend Quadratec's Online Store , and direct links can be found below. 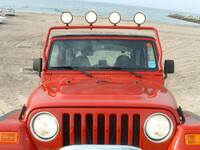 The Mopar Lightbar provides a very clean installation by allowing the wiring for the lights to run inside of the bar. 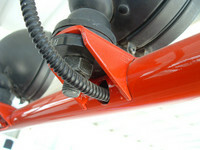 The bar mounts to the existing windshield hinges and the only hole drilled is a small one to pass the wire through, sealed with a rubber grommet. The wiring travels inside the bar and then exits neatly behind the light tabs. The Mopar bar is a bit taller than we'd like, but other than that, very nicely made. The only problems with mounting them above the window is the increased aerodynamic drag, a small effect on a box like the Jeep but a noticeable one nonetheless. We've also found that the lights being high up increases unwanted attention from the local Police. We recieve frequent reminders from the Police that the lights are not to be used on the road.. To be fair, they are right. They will blind other drivers. To reduce that unwanted attention, fitting solid covers over the lights makes it clear that you don't intend to turn them on. Finally, you do need to be aware of the increased height to your vehicle. Trees, underground parking, and car-ports will all keep you on your toes. With the Lights installed, the difference is DEFINITELY noticeable in the dark. The KC lights put out a very far beam ("pencil beam") which is good for seeing over a long distance. It's a good idea to take some time to fine-tune the aiming of the lights. When the dealer installed them, they had all four lights aimed exactly ahead, creating a very narrow field of view. We went out to the sand at night and re-aligned them so that the edges of each beam were slightly touching, creating a wider field of view. We basically spread them out a bit, and this made a significant improvement as off roading isn't always straight ahead! With the alignment fixed, it's very nice to have Daylight on command! They come in very useful at night and are great if you need to work infront of the vehicle, for example setting up or fixing something at the camp site after dark. Be warned though, with 4 x 100W lights on the roof of your vehicle, you should keep a close eye on battery level if used with the engine off. One other warning, if you are using the hard covers, be sure to use a switch which has a light in it. The lights get HOT and can melt the covers, so it's a good idea to know if the lights were accidentally turned on. For driving off road, they're great. If the route is twisty, grab the outer onces and turn them slightly to see more to the sides when going round corners. If not, leave them pointing ahead and enjoy being able to see in the dark! We give them an 8 out of 10 - they're bright and they're a significant improvement over the stock lights alone, and being Mopar parts they have no effect on the Vehicle's Warranty. A wider beam pattern would see them getting a higher mark. The KC Daylighters also carry a massive 23 year Limited Warranty, should you ever need it. Just be sensible and don't use them on-road! Contact your local Jeep Garage for the Lightbar!